This article is about the location. For the quest, see Woodhearth (quest). Woodhearth is a city in western Greenshade. 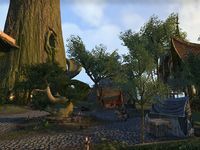 It is the capital of the Greenshade region, ruled by Treethane Fariel. It is a major trading port and ships carry wares across the Aldmeri Dominion. The Thalmor have a significant presence in the city, and are led by Oromin. There is a great deal of tension between the Thalmor and the other residents of the city, though the Wood Elves begrudgingly accept the need for Thalmor protection. For more information on Woodhearth, see the lore article. Woodhearth Objective: Put a stop to Pelidil's plans in Woodhearth. Veil of Illusion: Trick a Heritance spy into assassinating the "queen". Double Jeopardy: Uncover the Heritance spy's plan to conquer Valenwood. The Amronal of Valenwood: Defeat a wispmother haunting the marshes. In the Belly of the Sea Hawk: Recover a shipment of fine silks. Manthir's Debt: Settle a dispute over an overdue debt and the Bosmer Right of Theft. The Unfilled Order: Complete a contract in Barrow Trench. Imperial Underground — The ancient sewer system of Woodhearth. Crocodile - at the river. This page was last modified on 19 November 2018, at 05:34.